This post is the first in a 3-part series on Marx’s “Wage-Labor and Capital.” Part 1 covers chapters 2-4, part 2 chs. 5-6, and part 3 chs. 7-9 (the first chapter is an unnecessary introduction). The main idea of the work is that capitalists obtain all their advantages by exploiting the labor of workers. You can find the rest of the series here. Workers typically define wages as what a capitalist pays a worker for hours of work or a completed project. Marx contends, however, that the worker actually sells his labor-power—a commodity—to the capitalist. Prices are the exchange rate of a commodity in money terms. Wages aren’t a share in the product produced, but are commodities themselves, given to workers in order to live. Work is not the worker’s life; his life begins when his work ends. How Do Commodities Get Their Price? Prices obtain their exchange rate from the competition between buyer and seller. Competition between sellers drives price down; competition between buyers drives price up. 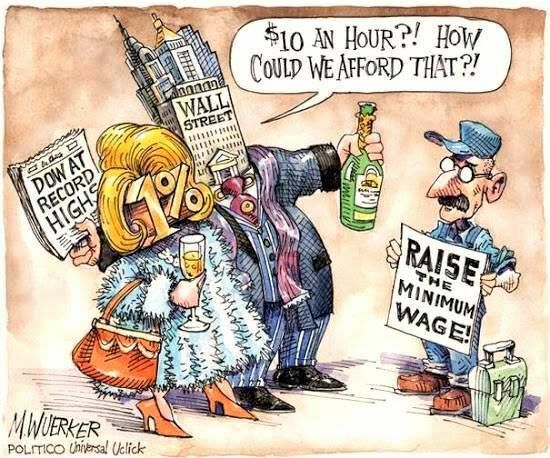 In this case, the capitalists are the buyers and the workers are the sellers. Since workers far outnumber the capitalists, the capitalist, in addition to owning the means of production, has an enormous advantage in buying whatever worker he desires. The cost of production factors in to the seller’s profit. When price goes below the cost of production, capital withdraws its investment. What is the cost of production? It includes labor time, raw materials, and machine maintenance. The laws of commodities apply to wages. Labor costs the capitalist the amount of money required to train the worker, keep him alive, and literally reproduce the worker through sexual reproduction. Shorter training periods save the capitalist money, because then he has to pay less for non-production. According to Marx, however, this “minimum wage,” refers not to the individual worker, but to the class of workers.